The Philadelphia Flyers announced today that they have signed 6’5”, 220-pound defenseman Braydon Coburn to a multiple-year contract extension, according to club General Manager Paul Holmgren. “Braydon is a good young defenseman that we believe will continue to get better,” said Holmgren in making the announcement. Coburn, 22, has posted eight assists and 28 penalty minutes in 23 games for the Flyers this season. Over parts of the last two seasons, Coburn has recorded three goals and 12 assists for 15 points and 44 penalty minutes in 43 games for the Flyers. He has registered three goals and 17 assists for 20 points and 78 penalty minutes in 81 career regular season NHL games over the last three seasons with the Atlanta Thrashers and the Flyers. 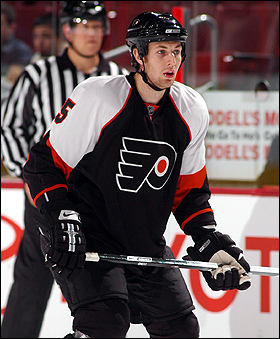 He was acquired by the Flyers from Atlanta in exchange for Alexei Zhitnik on February 24, 2007. Over parts of three AHL seasons (2004-05 through 2006-07), he recorded seven goals and 31 assists for 38 points and 175 penalty minutes in 91 regular season games. A native of Calgary, Alberta, Coburn posted an assist and 36 penalty minutes in 18 playoff games as the Wolves advanced to the 2005 Calder Cup Finals (losing to the Philadelphia Phantoms).